"Songs from the Lounge" now available! Sounds from the lounge: Click here or on the image to listen! Send a unique gift. More than 70 minutes of relaxing music. Just what the doctor ordered after a stressful day. Sit back and relax. All songs written, recorded, and produced by John Brueske. It will be shipped by itself via U S postal service Delivery within the United States. Click on the image to hear the latest music from John Brueske. Order your copy today for only $14.99 with Free Shipping! 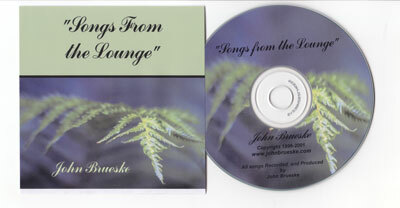 "Sounds from the Lounge", the second CD in the series is being released soon!